After last week's furious newflow and peak earnings calendar, there is a palpable sense of exhaustion as we head into the new week, which coupled with China's Lunar New Year, assures a much more subdued trading environment, as seen already by the listless moves in US equity futures. Meanwhile, coming off the back of a record breaking run for markets in January, there isn't a huge number of hurdles for markets to jump this week, when President Trump's delayed State of the (Dis)Union address, another slew of corporate earnings releases and the BoE meeting will the highlights. That said, there is still a sizeable backlog of top-tier economic data to work through which may or may not be released next week. In addition, we get the final global PMIs while Brexit and US-China trade headlines are unlikely to stray too far from the spotlight. Friday has the RBA’s monetary policy statement, and Canadian labour data. As Deutsche Bank's Craig Niccol writes, President Trump's delayed State of the Union address on Tuesday will likely be the early focus for markets, where the impasse over Trump's proposed border security wall is likely to be the highlight, especially with heightening tension between Trump and House Speaker Pelosi. Notably, this will be the first time Trump addresses a divided Congress with the official Democratic response due to come from Stacey Abrams. As for central banks, the BoE meets on Thursday however no change in policy is expected at the meeting. Recent data in the UK has been incredibly mixed. Survey data in particular has been weak (most notably the PMIs but also credit conditions and RICS etc) while on the other hand the latest round of employment data in the UK was undeniably strong with the supply side narrative of a tighter UK labour market very much in tact. This is likely to prove a puzzler for the MPC so it'll be interesting to see what Carney says. It's worth noting that this meeting will include new economic forecasts. Clearly Brexit will be a key determinant for the BoE's outlook with PM May now pledging to go back to Brussels to restart talks with the EU before the next likely Parliamentary vote on 13th February. Our FX strategists' latest views on developments are here in which they recently turned neutral on Sterling following the amendment vote results this week. Meanwhile the earnings calendar remains busy next week with 98 S&P 500 companies due to report. The highlights include Alphabet on Monday, WaltDisney on Tuesday, General Motors on Wednesday, and Twitter on Thursday. DB's US Equity Strategist Binky Chadha noted that despite solid equity market performance and off-the-charts individual stock performance, Q4 earnings have disappointed significantly so far with the lowest beats in 7 years, and underlying growth has fallen sharply to 3.4% in Q4 from a relatively steady 11% earlier which raises the risk of zero to slightly negative earnings growth in Q1. In Europe next week the earnings highlights include BP on Tuesday, GlaxoSmithKline, Daimler and BNP Paribas on Wednesday, and Total, L'Oreal and Sanofi on Thursday. In Asia SoftBank reports on Tuesday, Toyota on Wednesday and Nippon on Thursday. As for the data highlights, the calendar continues to be complicated by the impact of the government shutdown with the BEA still working it's way through a large backlog of releases. As a result the timing of those remains uncertain but for what it's worth some of the top tier releases that still remain include Q4 GDP, December PCE, December advance goods trade balance, December housing starts, and December retail sales. Clearly as this backlog begins to clear we'll start to get a better picture of how the US economy tracked into the end of last year and beginning of this. In terms of what we will definitely get next week, the January ISM non-manufacturing on Tuesday, and preliminary Q4 nonfarm productivity and unit labour costs on Wednesday are the highlights. Claims on Thursday could also be worth a watch in light of the big tick higher this week. The market will also likely keep a close eye on the final January services and composite PMI revisions in Japan, Europe and the US on Tuesday. Friday's final manufacturing revisions in Europe confirmed an even weaker manufacturing print for Germany (49.7 vs. 49.9 flash) while Italy came in weaker than expected at 47.8 (vs. 48.8 expected). It'll be worth keeping an eye on the remaining data for the noncore. Meanwhile, other data to keep an eye on includes China's January Caixin PMIs on Sunday (services and composite), and December industrial production reports in Germany (Thursday) and France (Friday). Coming back to central banks, Fedspeak starts to ramp up again next week with Mester speaking on Tuesday in Cleveland on the economic outlook and monetary policy, Quarles on Wednesday in New York on bank stress testing, Powell on Wednesday night in Washington albeit at a town hall meeting with educators, Clarida on Thursday in Prague on a paper he wrote in 2017 on the 'global factor in neutral policy rates', and Bullard on Friday on the economy and monetary policy. Other events to potentially look out for next week include the ECB's Visco speaking tomorrow in Rome, German Chancellor Merkel traveling to Japan to meet with PM Abe for two days of meetings on Monday and then meeting leaders in Eastern Europe on Thursday to discuss EU integration, the ECB's Mersch speaking on Thursday, and the latest European Commission forecasts on Thursday. 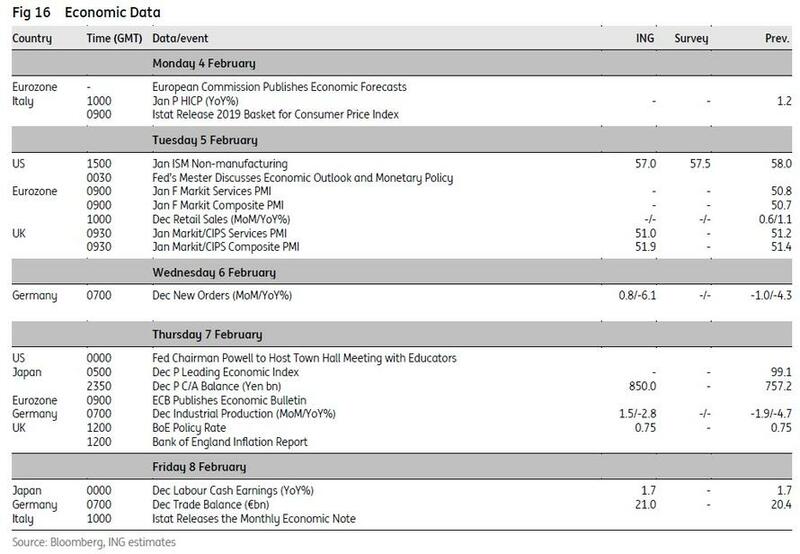 Monday: It's a quiet start to the week for data with the only releases of note being the February Sentix investor confidence reading and December PPI for the Euro Area, preliminary January CPI for Italy and final November factory orders, durable and capital goods orders revisions in the US. Elsewhere, German Chancellor Merkel travels to Japan for meetings with PM Abe, while the earnings highlight is Alphabet. Tuesday: President Trump is scheduled to make his delayed State of the Union address to Congress. Datawise, the main focus should be the final January PM revisions around the globe. Away from that we'll also get BRC sales data for January in the UK, December retail sales for the Euro Area, and the January ISM non-manufacturing print in the US. The Fed's Mester is also due to speak early in the morning. Earnings highlights include Walt Disney, BP and SoftBank. Wednesday: It's a very quiet day for data with December factory orders in Germany and the November trade balance, and preliminary Q4 unit labour costs and nonfarm productivity in the US due. Meanwhile Fed Chair Powell is due to host a late night town hall meeting with educators. Earnings highlights include Toyota, Eli Lilly, GlaxoSmithKline, Daimler, BNP Paribas and General Motors. Thursday: The BoE policy meeting is likely to be the main focus. As for data, December industrial production in Germany, December trade balance in France, the latest weekly initial jobless claims print in the US and December consumer credit in the US are the highlights. The European Commission will also publish its latest economic forecasts while Fed Vice-Chair Clarida is due to speak. German Chancellor Merkel is also due to visit leaders in Eastern Europe on the subject of closer EU integration while the ECB's Mersch is due to speak. Earnings highlights include Total, L'Oreal, Sanofi, Nippon and Twitter. Friday: Overnight we'll get cash earnings data for December in Japan while data in Europe include December trade data in Germany and December industrial production in France. There's no data scheduled in the US however the Fed's Bullard is due to speak. Finally, looking at just US economic data, Goldman notes that the key economic data release this week is the ISM non-manufacturing index on Tuesday. There are a number of scheduled speaking engagements by Fed officials this week, including a town hall by Chairman Powell. The Census Bureau and Bureau of Economic Analysis will likely continue to release backlogged data this week as the government continues normal operations. 10:00 AM Factory Orders, November (GS -0.1%, consensus +0.3%, last -2.1%); Durable goods orders, November final (last +0.8%); Durable goods orders ex-transportation, November final (last -0.3%); Core capital goods orders, November final (last -0.6%); Core capital goods shipments, November final (last -0.1%): We estimate factory orders decreased 0.1% in November following a 2.1% decline in October. Durable goods orders increased in the November advance report, driven primarily by an increase in aircraft orders. 07:30 PM Cleveland Fed President Mester (FOMC non-voter) speaks: Cleveland Fed President Loretta Mester will discuss the economic outlook and monetary policy in Cleveland, Ohio. Prepared text and audience Q&A are expected. 10:00 AM ISM non-manufacturing index, January (GS 56.7, consensus 57.0, last 58.0): Our non-manufacturing survey tracker decreased by 1.3pt to 52.7 in January, following broad-based declines in regional service sector surveys. The tracker remains 5.3pt below the December reading of the ISM non-manufacturing index, and indicates that there may be some “catch-down.” However, the rebound in stock market performance may be a tailwind to performance. We expect the ISM non-manufacturing index to move down by 1.3pt to 56.7 in the January report. 08:30 AM Trade balance, November (GS -$54.5bn, consensus -$54.0bn, last -$55.5bn): We estimate the trade deficit declined by $1.0bn in November, reflecting a decline in inbound and outbound container traffic following elevated levels in October. The advance goods trade balance report for November, part of the Census Bureau’s report on Advance Economic Indicators, was not released because of the government shutdown. 08:30 AM Nonfarm productivity (qoq saar), Q4 preliminary (consensus +1.7%, last +2.3%); Unit labor costs, Q4 preliminary (consensus +1.7%, last +0.9%): The release will be incomplete and will likely be limited to hours worked and manufacturing productivity data. 06:05 PM Vice Chairman for Supervision Quarles (FOMC voter) speaks: Fed Vice Chairman for Supervision Randal Quarles will discuss the Federal Reserve stress testing in New York. Prepared text and moderated Q&A is expected. 07:00 PM Fed Chairman Powell (FOMC voter) speaks: Fed Chairman Jerome Powell will host a town hall meeting with teachers in Washington DC. The event will be live streamed. 08:30 AM Initial jobless claims, week ended February 2 (GS 215k, consensus 223k, last 253k); Continuing jobless claims, week ended January 26 (consensus 1,728k, last 1,737k): We estimate jobless claims decreased by 38k to 215k in the week ended February 2, following a 53k increase in the prior week. We expect seasonal factors to revert to normal after the week of the Martin Luther King, Jr. holiday. Moreover, claims in the state of California are quite elevated, suggesting scope for declines. 09:15 AM Dallas Fed President Kaplan (FOMC non-voter) speaks: Dallas Fed President Robert Kaplan will speak at an event hosted at the Dallas Fed. Media and audience Q&A is expected. 09:30 AM Fed Vice Chairman Clarida (FOMC voter) speaks: Fed Vice Chairman Richard Clarida will discuss a research paper he wrote in June 2017 on the global factor in neutral policy rates at a Czech National Bank academic conference in Prague. Audience Q&A is expected. 07:30 PM St. Louis Fed President Bullard (FOMC voter) speaks: St. Louis Fed President James Bullard will speak about the U.S. economy and monetary policy. Presentation slides, audience Q&A and a press briefing are expected. There are no major economic data releases.